CANADA - MEDICAL UPDATE - Scott Routley's parents say they always thought he was conscious and could communicate by lifting a thumb or moving his eyes. But this has never been accepted by medical staff. Prof Bryan Young at University Hospital, London - Mr Routley's neurologist for a decade - said the scan results overturned all the behavioural assessments that had been made over the years. "I was impressed and amazed that he was able to show these cognitive responses. He had the clinical picture of a typical vegetative patient and showed no spontaneous movements that looked meaningful." Observational assessments of Mr Routley since he responded in the scanner have continued to suggest he is vegetative. Prof Young said medical textbooks would need to be updated to include Prof Owen's techniques. The BBC's Panorama programme followed several vegetative and minimally-conscious patients in Britain and Canada for more than a year. Another Canadian patient, Steven Graham, was able to demonstrate that he had laid down new memories since his brain injury. Mr Graham answers yes when asked whether his sister has a daughter. His niece was born after his car accident five years ago. The Panorama team also followed three patients at the Royal Hospital for Neuro-disability (RHN) in Putney, which specialises in the rehabilitation of brain-injured patients. It collaborates with a team of Cambridge University neuroscientists at the Wolfson Brain Imaging Centre at Addenbrooke's hospital, Cambridge. 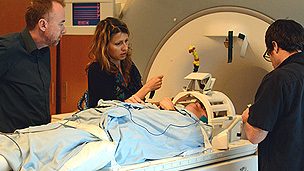 Another patient, who was not able to be fully assessed by the RHN because of repeated sickness, is later shown to have some limited awareness in brain scans.